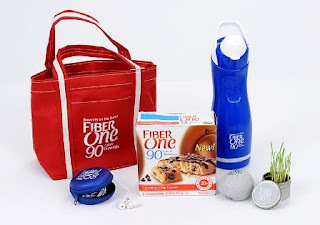 Frugal & Fabulous: Fiber One 90 Calorie Brownie Survival Pack Review & Giveaway! Fiber One 90 Calorie Brownie Survival Pack Review & Giveaway! My husband and I love sweets! But everything in moderation right? So when I get a craving for something sweet now we reach for our new favorite treat: Fiber One 90 Calorie Brownies! We were recently given the opportunity to review the chocolate chip variety and I tell you, they were pretty darn good! It's basically a chocolate chip cookie bar with dark chocolate chips and you'd never guess that each serving provides 20 percent of the Daily Value of fiber (5g)! And at 90 calories and three grams of fat - this treat gives you nothing to feel guilty about. These sweet treats are perfect whenever you get a chocolate craving or you need a little pick me up at work. A few days ago I was having a particularly tough day and was able to feel a little better about it for a few minutes while enjoying my 90 calorie brownie! I opened up my little survival pack, took out my stress ball and enjoyed my Chocolate Chip Brownie! Fiber One Brownies are the perfect pick-me-up! The other items in the survival pack were also great - who can't use a set of headphones or a nice water bottle? I also am enjoying the office grass! One lucky Frugal & Fabulous reader will win a survival kit! Chocolate Fudge and the 90 Calorie Chocolate Chip Cookie! Thanks! 90 Calorie Chocolate Peanut Butter for sure! chocolate peanut butter. Entered the Rafflecopter form as "Crave to Save"
I'd love to try them all but especially the chocolate peanut butter. I'd like to try the chocolate chip cookie flavor.